Lately I’ve found myself collecting short non-fiction books. Collecting makes it sound grandiose, but my stash of 30 or so volumes is smaller in aggregate than a breadbox. It’s also been less intentional than the word “collecting” implies: The books seem to turn up of their own accord like stray kittens or spare socks, orphaned except for the company of their own kind. Each one on its own might not amount to much, but together they comprise a highly portable compendium of human knowledge. Monographs are in style, from Ben Lerner’s The Hatred of Poetry to Kristin Dombek’s The Selfishness of Others and Edwidge Danticat’s The Art of Death, all presenting critical, topical investigations driven by the wry voices of their authors. The format can be a venue for public discourse on pressing issues, too, as in Valeria Luiselli’s Tell Me How It Ends, a harrowing first-person look into the immigration system, or Eula Biss’s On Immunity, with its eloquent delineation of vaccines. Brian Dillon’s Essayism, however, is the ultimate literary ouroboros: a book-length essay on essayists. But this gloss gives short books short shrift. Short books are not narratives, but devices: instead of the telescope of a long novel or history tome, they are a pair of sunglasses, allowing you to see the world, briefly and temporarily, in a different shade. 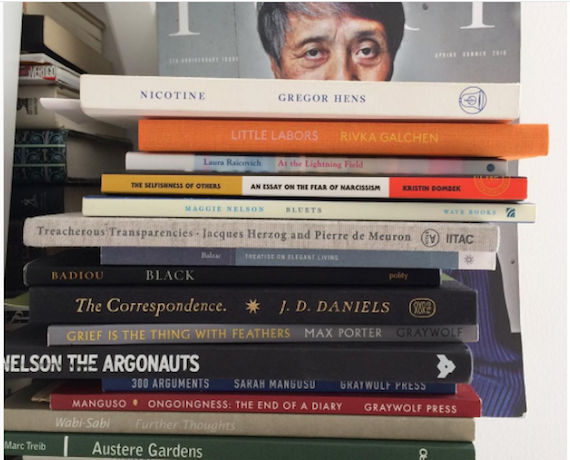 Most mornings, I look at the stack on my shelf, a rainbow of thin spines, and pick a few to carry with me—to a cafe, on the subway, to my office. Like choosing an outfit, the books both express and influence how I feel that day. Say the mood is colorful. Here you have options, because a single color is the perfect subject for a short book. In Bluets, Maggie Nelson can tell you about blue, and patches of blue outside seem to glow with new meaning. Alain Badiou’s Black offers the semiotics of that “non-color,” shot through with his own memories of (literally) dark moments: as a child playing in an unlit room or camping out in the French military. Kenya Hara, a Japanese designer, meditates on the emptiness of white in White; Han Kang has her own version coming up with The White Book. Each of these volumes frees its mates of the burden of being comprehensive: The short book doesn’t need to pretend that it’s the only object a reader has at hand. Instead, they are entries in a collective lexicon, a library you can take with you. These contain potent medicine (or poison, I sometimes think), and it’s a relief that each ends before too long, though still long enough to change your life. Like a pill, their form is always inextricable from their content, just right for proper delivery of the drug within. The paragon of the short-book form, for my taste, is In Praise of Shadows by the Japanese novelist Jun’ichirō Tanizaki. In the 42-page essay first published in 1933, Tanizaki contrasts the Japanese appreciation of darkness—the dim of rice-paper windows, candle lanterns, and black lacquered dishes—with the Westerner’s “quest for a brighter light:” electric lamps, glass windows, and white porcelain. The book’s brevity is synecdochic: It contains the world, from Noh drama to Albert Einstein, “murmuring soup,” the difficulties of building a house, an obscure local recipe for sushi, and what the author perceived as the roots of Japanese identity. Tanizaki persistently reminds readers that the essay is merely his vision, a personal worldview as an elderly novelist perhaps more at home in the previous century than his present. He claims no authority. Yet his ambition is grand, to preserve in writing that particular lens so that it might be experienced by others: “I would call back at least for literature this world of shadows we are losing,” he writes in the book’s final paragraph. Every time I open it, the patches of shade around me are briefly illuminated by Tanizaki’s prose. I Instagrammed In Praise of Shadows so many times that friends asked how long I was taking to finish it. Rather than some kind of brag, I just liked how it looked—it was fun to put a monochrome book about darkness in patches of bright sunlight, a visual pun. But getting to the end of a short book isn’t the point. It’s about rereading, mulling, flipping it open to see what you find, turning it over like a coin in your pocket. Tanizaki’s essay accomplishes the highest criteria I have for any book, short or long, which is that it offers an alternative aesthetic imaginary, a toolset to reconstruct the world in real time. Its voice sneaks into your head. And its format makes it convenient to keep hidden away in my bag, with me at all times. Kyle Chayka is a writer in Brooklyn. His first book, an essay on minimalism, will be published by Bloomsbury in 2019. So what do we want from our bookstores? Should we expect them to surprise us and deliver discoveries or to serve up exactly what we need? The same virtues cited here for short non-fiction books are characteristic of short works of fiction as well. Unfortunately, Americans are addicted to bloat when it comes to fiction, and reviewers act as enablers by passing over excellent short novels in favor of kitchen-sink behemoths. I look forward to reading, “In Praise of Shadows,” because I have a great interest in Japanese culture, mythology, and folktales which are full of dark imagery. I am also a fan of shorter books because I have a short attention span in many cases. Thanks for this well-written essay. Short and to the point. I think that this “bloat” is really an issue in literary fiction. People (publishing houses and the public) seem to be equating length with “serious” books. The Goldfinch could have easily lost a couple hundred pages, so could The Luminaries. Even some genre books are getting in on the action giving us mysteries over 600 pages. I read a mixture of lengths but find it frustrating when the long length is just not necessary and should have been edited out.